1. Preheat the oven to 200°C, gas mark 6. Put the bulgar wheat in a heatproof bowl, cover with boiling water and set aside for 10 minutes. Drain, then spread out on a baking tray, sprinkle with cinnamon and stir it in. Put in the oven for 10-15 minutes to dry out and crisp up, stirring once or twice, then transfer to a serving bowl and set aside to cool. 2. When ready to serve, stir in the prepared salad onions, carrot, cucumber, parsley, mint, oil and lemon or orange zest and juice. Gently fold in the figs and scatter with the pistachios and sumac. 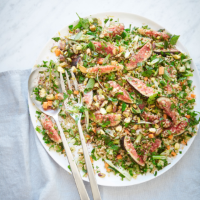 Bump up the protein in this tabbouleh by topping with crumbled goats’ cheese or a spoonful of yogurt.